There was rejoicing in the Skiffle Steel Orchestra’s pan yard yesterday as the band recorded its highest score in its history to place overall second behind Renegades, in the National Panorama preliminary large conventional band category. High fives, fist bumps, congratulatory handshakes and hugs were the order of the day as the San Fernandians saw this as a sign, this may be the year a south band brings home the elusive National Panorama title only for the second time in pan history. Hatters is the only other south band to win the title and that was in 1975. While not as boastful, San Fernando Mayor and band manager Junia Regrello was elated. Admitting that he craved the victory, Regrello said he was cognisant of the fact that this was only the first step towards achieving their ultimate goal. He attributed their success thus far, to switching the tune of choice five days before the preliminary judging on Tuesday night. Since December, the band had been practicing Voice and Marge Blackman’s duet, Full of Vibes. Fans who filled the panyard and spilled over on both sides of Coffee Street on Tuesday night, were pleasantly surprised to hear Skiffle play an arrangement of Kees Dieffenthaller’s Hello (on the Folklore Riddim) instead, for the judges. This is the second steelband to drop its original song in favour of Hello. Earlier this month, Phase II composer and arranger Len “Boogsie” Sharpe incurred the wrath of young soca artiste Nailah Blackman over his decision to switch from playing her song Sokah to Hello. Like Boogsie, Regrello, has fallen in love with the melody and simplicity of Hello. Regrello’s son Joshua, to whom he has passed the baton of leadership, said it was not a singular but a collective decision of management, arrangers and players to engineer the change. Joshua said he has a good feeling about this choice and the Kendall Williams, Odie Gonzales and Mark Brooks arrangement. He said they are going all out to make a statement for 2018 with Hello. 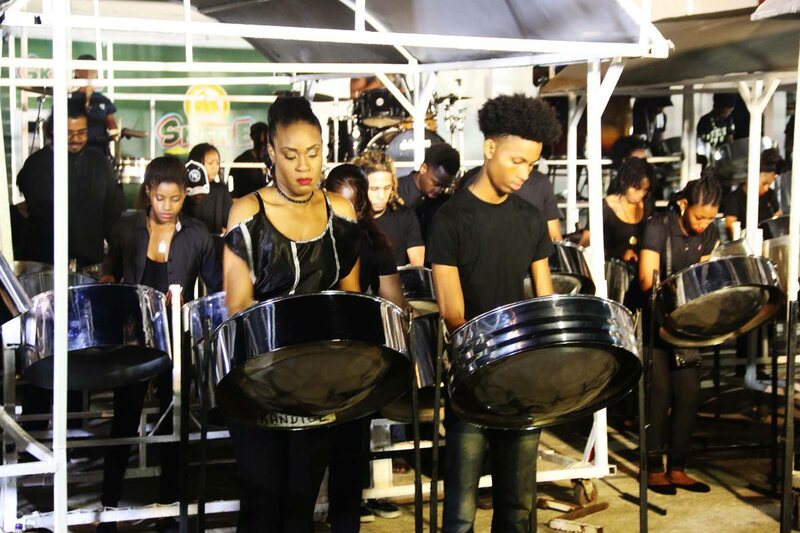 Skiffle is one of two steelbands in the large conventional category in San Fernando and one of four in the South/Central Region of Pan Trinbago. The other San Fernando band is NLCB Fonclaire which gave a rousing performance of Maximus Prime’s, Inside the Festival, arranged by Leon Foster Thomas. Inside the Festival arranged by Richard Giltens, was also La Brea Nightingales Panorama tune of choice while the fourth large band in the region, Tropical Angel Harps, is betting on Patrice Roberts’, Sweet Fuh Days, to secure them a place in the finals. Reply to "Historical placing for Skiffle with Hello"